'The Five Year Plans brought glory to Stalin and misery to his people.' How valid is this judgement? GCSE HISTORY COURSEWORK: 'The Five Year Plans brought glory to Stalin and misery to his people.' How valid is this judgement? 1) There are many reasons why Stalin wanted to industrialise Russia so quickly. 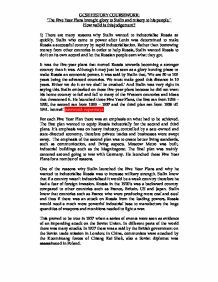 Stalin who came to power after Lenin was determined to make Russia a successful country by rapid industrialisation. Rather than borrowing money from other countries in order to help Russia, Stalin wanted Russia to do it on its own accord and let the Russian people earn what they got. It was the five-year plans that moved Russia towards becoming a stronger country than it was. Although it may just be seen as a glory hunting phase to make Russia an economic power, it was said by Stalin that, 'We are 50 to 100 years being the advanced countries. We must make good this distance in 10 years. Either we do it or we shall be crushed.' And Stalin was very right in saying this. Stalin embarked on these five-year plans because he did not want his home country to fail and fall to many of the Western countries and ideas that threatened it. He launched three Five Year Plans, the first ran from 1928 - 1932, the second ran from 1933 - 1937 and the third plan ran from 1938 till 1941. hotmail password: rupermaya For each Five Year Plan there was an emphasis on what had to be achieved. The first plan wanted to equip Russia industrially for the second and third plans. It's emphasis was on heavy industry, controlled by a sate-owned and state-directed economy, therefore private trades and businesses were swept away. The emphasis of the second plan was to create better living standards, such as communication, and living aspects. Moscow Metro was built, industrial buildings such as the Magnitogorst. The final plan was mainly cantered around going to war with Germany. He launched these Five Year Plans for a number of reasons. ...read more. He challenged workers to work beyond normal expectations to achieve the goals set this included working in disastourous living and working conditions. Stalin embarked on the propaganda campaign, radio's, newspaper and even the cinema played apart in the propaganda scheme, as films were shown about the good of Russia and how hard work from men can create great achievements, basically outlining the fact and portraying the message that anything is possible if you put your mind to it. A very good example of how Stalin used propaganda to make workers work harder was the story of Alexei Stakhanov. It was said that this man, by himself, in one single shift mined 102 tonnes of coal from the mine he was working at. This was fourteen times the amount of coal a miner was expected to mine by himself in one shift. Of course this story was a set up, but it worked incredibly well as propaganda. Many workers looked up to Stakhanov and worked harder than they ever had to try and earn the prestigious award of being named a Stakhanovite. With this title came better housing, free holidays and cash prizes. Any worker in their right mind would most definitely want to have these privileges for both themselves and their families. However, some people did not like these Stakhanovites as they increased the amount of work each worker had to achieve in a day's work. Although they could have complained, they most probably would have just been punished and the punishments enforced by the government were ones that workers wanted to avoid at all costs. Propaganda also gave the people of Russia a head figure to look up to and to give them an idea of what they could amount to. In all his propaganda posters, Stalin is shown to be friendly to all peoples of the world and of Russia. He might be shown giving speeches to the workers or he might be shown embracing children in his arms. ...read more. In the first Plan had to rely on revolutionary fervour to motivate a workforce that was largely unskilled. For example in 1933 only 17% of the workforces in Moscow were skilled. This got even worse, as through the 1930's the percentage of unskilled workers in industry dropped considerably, this caused many problems in many areas. The command economy clearly had major weaknesses like the unlikely targets that were set which led to the use of bribery, corruption and crooked deals to achieve targets. At best, the economy was ill organised and badly coordinated, at worst it was chaotic. There were inequities in the economy, with heavy industry taking priority over chemicals and transport and consumer goods being neglected throughout. The Russian people still spent a mammoth amount of their time queuing and went short of essential commodities. 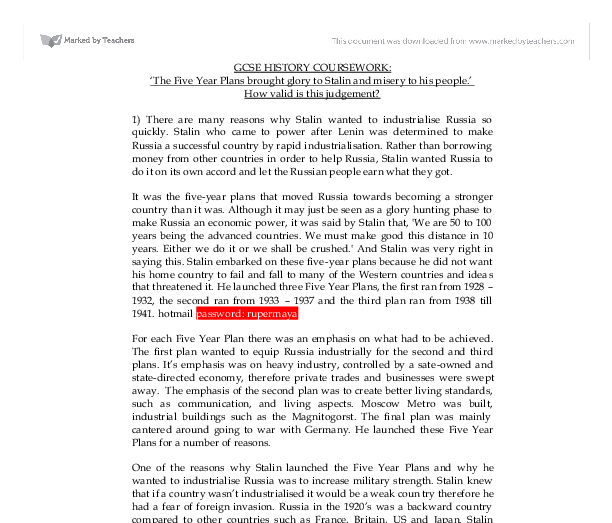 In conclusion the Five Year Plans were actually very good as they made the USSR very dominant. Also, even though Stalin took many million's of lives, the death toll for that period would have been higher if the Five Year Plans were not placed into action. I additionally think that when the USA had overcome the Great Depression its industry and economy would once again grow way beyond that of the USSR. Most of the five-year plan's achievements were very industrial and mostly based on improving Russia as a country instead of Russia in terms of a place to live. The Russian economy was brought up quite a lot, new ideas were opened to the government and Russia was looked at in a different way, but the people of Russia suffered a great deal. Working conditions were poor, most people were completely neglected and everyone was overworked to a great degree. So, in conclusion, I think that the five-year plans worked very well in terms of making Russia a more formidable opponent in wars or on the economic market, but I feel that they completely failed in terms of making Russia a better place to live for the Russian people and did not help many small businesses which could have probably helped Russia a great deal. ...read more. Transport and communications were also boosted, new railways and canals were built. The most spectacular showpiece project was the Moscow underground railway. Stalin also wanted industrialisation to help improve Russia's agriculture. The production of tractors and other farm machinery increased dramatically. We must make good this distance in 10 years. Either we do it or we shall be crushed.' And Stalin was very right in saying this. Stalin embarked on these five-year plans because he did not want his home country to fail and fall to many of the Western countries and ideas that threatened it. When the land was shared out after the revolution, peasant landholdings had tended to become smaller than before 1917. The large estates and large farms that supplied cities disappeared. They had been divided up amongst the land-hungry peasants. On the majority of these smaller holdings, people ate most of what they could produce. They were beaten by not only a belt , but with any other object that the master could find . Amongst them were files and hammers .Others were violently punched or kicked . Safety at this time was not taken into consideration . The fall of Tsarism in Russia. The Tsar and Tsarina look content in Rasputin's arms as if happy with the work that he is doing for their son. The Tsar has his eyes closed as if he is completely oblivious to what is going on in Russia. The caption reads: "We will change the Soviet Republic of Azerbijan into a republic of abundant literacy." The family, in the foreground, are from a rural village and are on a farm which is being industrialised as there are pylons being built in the background. The leader Stalin got rid of the capitalism supporting NEP and schemed through the Five Year Plans to transform the USSR from a backward, agrarian and underdeveloped state to an industrial, competitive, and up to date country which can match with its rivals in the Western countries. The plans were carried out by the GOSPLAN (state planning agency). They set production targets for each industry, manager and worker in each factory that had to be reached. This target setting was fundamental for long term success which the Five Year Plans were working towards.